Eclectic Interiors has a team of kitchen designers that work hard to create your perfect kitchen. We create a bespoke kitchen design that incorporates your chosen appliances and design choices resulting in your dream kitchen. Our range of Shaker Style Kitchens can be customised to suit your tastes, and our installations team will ensure that your new kitchen is installed both professionally and in a timely manner. 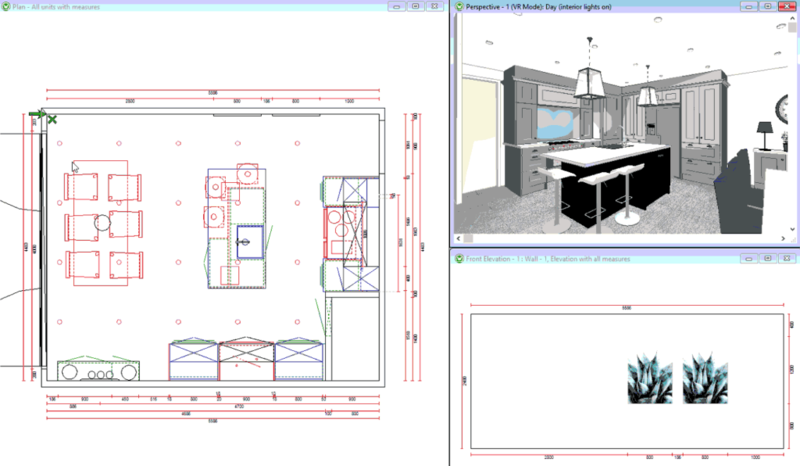 Our South London kitchen designers use kitchen planning software that creates a visual 3D image of your kitchen. This assists us in making key decisions on the placement of your new kitchen units and kitchen appliances. Visit our London showrooms to see our Attention to detail. Bespoke kitchens London, a kitchen design service provided by our team at Eclectic Interiors which allows us to work closely with you to create your dream kitchen. As you can see from the image on the right, we plan your kitchen to scale, selecting your kitchen design choices and positioning based on the dimensions of your space as a result, allowing us to create a 3D image of your kitchen. Our handmade, modern kitchens, come with 5 years warranty. We’re also a Miele kitchen designer, a popular German brand boasting unique style and finesse. Speak to us about a kitchen design consultation or visit our kitchen showroom in Clapham.